Six New England Patriots players have a message for the Trump White House: We're just not that into you. Since the team won an historic fifth Super Bowl with a stunning come-from-behind victory over the Atlanta Falcons in overtime on February 5th, a growing number of players on the team have told the press that they would turn down an invite to commemorate their victory at the White House. And while some have not explicitly cited President Donald Trump and his policies as the reason — some have — and the number of players planning to boycott a future photo-op is unprecedented compared to years past. "We've never seen anything like this," Edge of Sports writer and Nation contributor Dave Zirin told NBC News on Friday. "It has extra meaning coming from a team that all over social media — by both sides — was being called 'Team Trump.'" President Trump does enjoy a close personal friendship with team owner Robert Kraft, and has touted the endorsements of coach Bill Belichick and star quarterback Tom Brady. In an interview with Fox News' Bill O'Reilly prior to the Super Bowl, he conceded that his public fandom was making the Patriots polarizing. "They're taking a lot of heat. But you know what? They're also getting a lot of popularity out of it. I think they're going to do very well. Tom's a winner," he said. 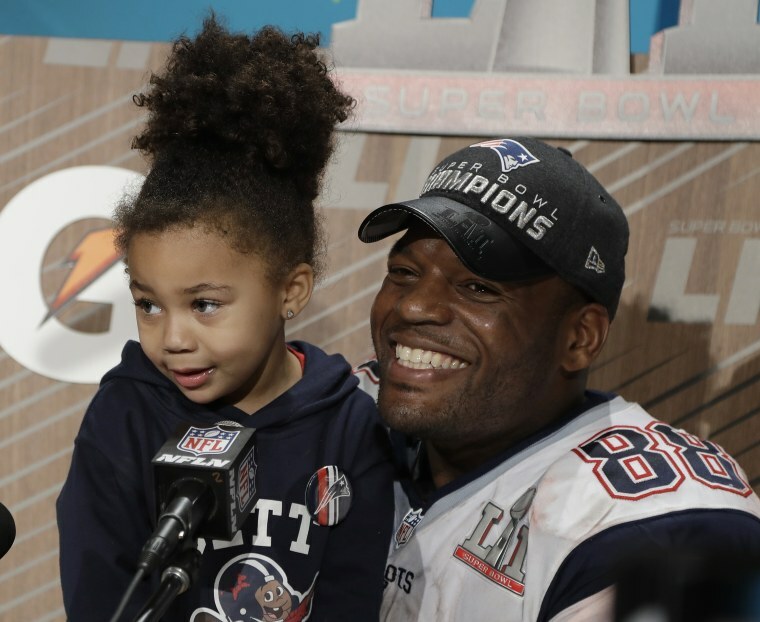 Both before and after the game, tight end Martellus Bennett was the first player to say he wouldn't join his teammates at any future White House celebration. Bennett made it very clear that Trump was the impetus for the decision. His sentiment was also echoed by star running back LaGarrette Blount who said, "I don't feel welcome in that house. I'll leave it at that," during an appearance of "The Rich Eisen Show" Thursday. Meanwhile, Dont'a Hightower, Chris Long and Alan Branch have now all also said they would turn down a request to come to the White House, but did not cite political motivations. And, running back James White — who had a breakout out game for the Patriots in the Super Bowl — has said he is considering skipping the trip but will wait until an invite is put forward to decide. Under President Barack Obama, three players from the undefeated 1972 Miami Dolphins turned down a photo-op at the White House over politics, as well as a handful of other athletes. Brady even skipped a 2015 invitation to the Obama White House — without publicly giving a specific reason why. And Presidents George W. Bush, Bill Clinton, George H. W. Bush and Ronald Reagan have all presided over the occasional athlete defection, but this snubbing feels more significant because of who this current commander-in-chief is and what the Patriots franchise has come to represent. In part because of Trump's attachment to the team, many sports fans began to see them as a red state franchise, even though ironically they hail from a cerulean state where every county went to Hillary Clinton last November. Even Richard Spencer, the widely reviled white nationalist, hopped on the Patriots bandwagon, calling their comeback win a victory for the "NFL's Whitest team," even though their roster is close to the league average in terms of African-American representation. "People were saying this was just like election night," said Zirin. "That was a wildly overstated generalization and assumption made by people who didn't understand the team's dynamics. The idea that this was 'Team Trump' versus 'Team John Lewis' existed in the minds of pundits more than in locker rooms." Zirin believes that by speaking out so publicly, these Patriots players are sending a "huge message," that not every player on the team is lockstep politically with Brady and ownership, but also that they are not interested in being permanently linked to a historically unpopular new president. Now, whether or not any of this will matter to President Trump is another story. "I never expected the President of the United States to respond to Nordstroms," said Zirin "So I'm at a loss about how he will react to this."